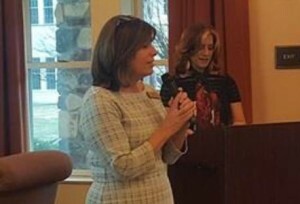 GROVELAND – Recently our team facilitated the DementiaLive™ program to nurses, case managers and social workers at Nichols Village Independent Living Community in Groveland, MA. The program consisted of 20 health care professionals from across the Merrimack Valley. Celeste Begley, CCM, CDP, Community Relations Director, and Victoria Guskiewicz, CCM, MS, Community Relations Coordinator from our Right at Home Haverhill office facilitated the training to the group. The program consisted of a formal presentation, a Q&A session and hands on sensitivity training. DementiaLive™ is a sensitivity awareness training developed by the Age-u-Cate Institute. Participants gain an in-depth understanding and awareness of what it is like to live with cognitive impairment, while also building awareness of the condition’s symptoms and gaining an in-depth understanding of the disease. About Right at Home Haverhill and Nichols Village, we are proud to provide coordinated home care services onsite with Home Health VNA to the residents at Nichols Village. We provide supportive services such as meal preparation, bathing, dressing, medication reminders and companion care. We believe in supporting seniors in their goal of living a healthy, safe and independent lifestyle. • Supports individuals living a healthy and rewarding lifestyle while maintaining independence. • Assures individuals can remain safe and comfortable in the privacy of their home at Nichols Village. • Assists in preventing unnecessary hospital stays. • Helps to prevent or postpone a move to a skilled care setting. • Assists with successfully aging in place. To schedule a training or for more information, please contact Victoria Guskiewicz, Community Relations Coordinator at vguskiewicz@rightathomemass.com or call (781) 568-0623.